CDC Chief: New Vaccines In Haiti Will Save Tens Of Thousands : Shots - Health News The campaign "will prevent 20,000 to 50,000 deaths among children in Haiti over the next decade," Dr. Thomas Frieden says at the end of a two-day trip to the nation. A campaign to introduce new childhood vaccines to Haiti will save tens of thousands of lives over the next decade, Dr. Thomas Frieden told Shots at the end of a two-day tour of the beleaguered country. "This is an enormous step forward for Haiti," says Frieden, director of the U.S. Centers for Disease Control and Prevention. "This is a big deal." The crash campaign will start this weekend. Just 3 of the 10 vaccines being deployed in the next two years "will prevent 20,000 to 50,000 deaths among children in Haiti over the next decade," Frieden said before boarding a plane home. Those three protect against Haemophilus influenzae B (Hib), rotavirus and pneumococcal pneumonia. The last two will be rolled out in the next two years. The drive beginning this week will protect against diphtheria, tetanus, whooping cough, hepatitis B and Hib (in a 5-in-1 shot), along with polio and rubella. In addition to these, Haiti is launching a "catch-up campaign" to vaccinate children against measles. "That's quite important," Frieden says. On Thursday, the CDC will issue a report on measles outbreaks in the U.S. caused by travelers to Europe and other countries where measles is resurgent because of flagging immunization. "It's quite common. The risk of measles being imported into Haiti is quite large," Frieden warns. "It's not there now, but if it were to get in, it could kill 20,000 kids in less than a year." 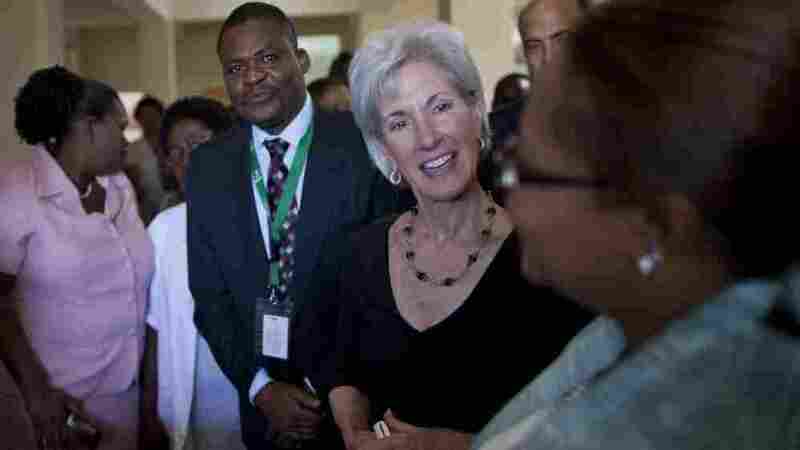 Frieden was part of a delegation to Haiti that included his boss, Health and Human Services Secretary Kathleen Sebelius. It was her first trip to Haiti. When the U.S. delegation arrived, a different vaccination campaign had just gotten started — a pilot project to immunize against cholera, which was introduced into Haiti 18 months ago. Frieden has been decidedly skeptical about deploying a cholera vaccine in Haiti. He'd earlier pointed out that such a vaccine had never been used in an ongoing cholera epidemic, and that the global supply of cholera vaccine was limited. The CDC has put the emphasis on cleaning up Haiti's water supply and providing decent sanitation as the best ways to combat cholera. That's still the case, but this week Sebelius and Frieden were more open about the potential role of cholera vaccine. On Monday, Sebelius said cholera vaccination and clean water sanitation was "not either/or," according to HHS spokesman Keith Maley. "I don't think it's really a question of disagreement, but what makes the most sense to save the most lives ... how to get the job done," Frieden told Shots. "There is zero disagreement [about] the need to strengthen water and sanitation systems throughout Haiti. ... In addition, we should look carefully at the current and potential future role for cholera vaccine." Frieden says it will take time to improve water and sanitation. "Nothing is easy in Haiti, I think that's safe to say," he says. "But we're optimistic. We've seen significant improvements in the past year."